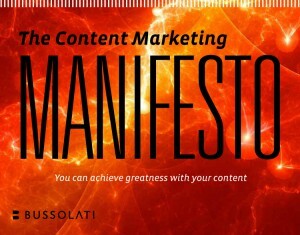 Download the Content Marketing Manifesto ebook here. Also check out Dierdre Reid’s thoughtful elaboration of the first five tenets. Or Ray van Hilst’s blog post about this manifesto and our presentation at ASAE12. Calling all publishers, editors, and content creators: If you’re creating content for a business, you are marketing. But you might be missing out on all that you can achieve with your superb content if you are not content marketing. This ebook builds upon the tenets of the Content Marketing Manifesto, which separate those who achieve greatness with their content from those who just create content, no matter how great it may be.